Yesterday we looked at the Napa River Bridge and the Mare Island Lift Bridge from the tower of the Carquinez Suspension Bridge. 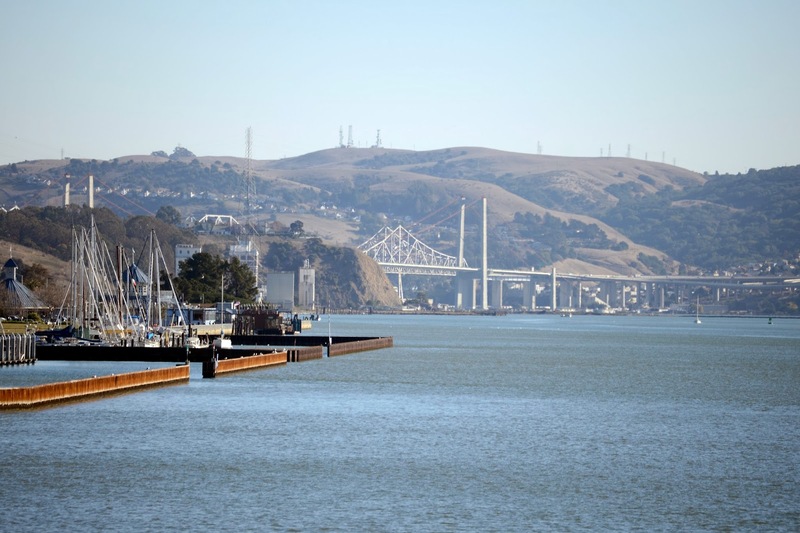 Today we are looking at the Carquinez Bridges from the deck of the Mare Island Lift Bridge. 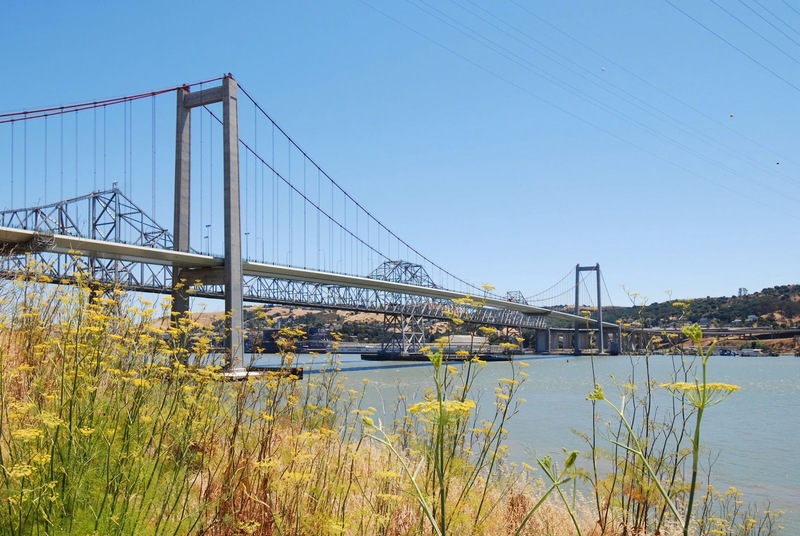 The Carquinez Bridges include a 1950s era truss bridge and a new suspension bridge. We studied these bridges previously when they were building the suspension bridge, retrofitting the truss bridge, and removing the 1920s era riveted truss bridge. The remaining truss bridge got an interesting seismic retrofit in the1990s that included shock absorbers at the expansion joints to prevent unseating at the ends of the cantilevers (above) and supports at the bottom of the towers to facilitate rocking (below). The bridges carry westbound and eastbound I-80 traffic across the strait that connects San Pablo Bay (on the west) to Suisun Bay (on the east). The photo shown below was taken before they completed the suspension bridge and before they removed the 1920s truss bridge. On the north (far) side of the bridges is the city of Vallejo and on the south (near) side is the town of Crockett that includes the big C and H (California and Hawaii) Sugar Refinery. Solano County, California Bridges: I-80 Bridges across the Carquinez Straits by Mark Yashinsky is licensed under a Creative Commons Attribution-NonCommercial-NoDerivatives 4.0 International License.